The New York chapter of the American Choral Directors Association (NYACDA) has named John Warren, associate professor and director of choral activities in the College of Visual and Performing Arts’ Rose, Jules R. and Stanford S. Setnor School of Music, the 2016 New York Choral Director of the Year. The award honors NYACDA members who have 10 or more years of conducting experience; establish high performance and literature standards; promote choral music in their community; and are consistent ACDA members who attend and support ACDA functions and statewide activities, as well as contribute to ACDA through work in district, state, regional or national conventions and committees. Warren received the award from NYACDA President Norman Zogaib at the New York State School Music Association summer conference in Albany earlier this week. 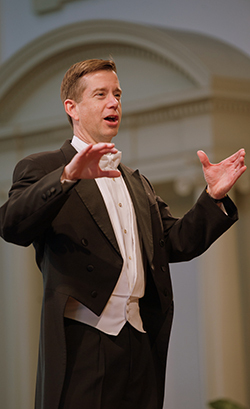 At the Setnor School, Warren conducts choirs and teaches both graduate and undergraduate courses in conducting, choral literature and rehearsal techniques. During his tenure, Syracuse choirs have been invited to perform at numerous state and regional conferences of the ACDA and toured throughout the northeast United States and Canada, as well as Argentina, Chile, France, Germany, Poland and Uruguay. Under his leadership, the Syracuse University Singers won the 2015 Grand Prix at the Florilegé Vocal de Tours in France and went on to compete for the European Grand Prix in Varna, Bulgaria, this past May. The ACDA is the pre-eminent association for choral conductors throughout the United States. Membership consists of choral directors who represent more than one million singers across the country.